Today I attended my Grandmother’s 94th Birthday celebration which was a cookout at my cousin’s house. In keeping up with the geometric trend I wore this ASOS CURVE Pencil Skirt In Rocco Print, $29.93 and paired it up with a Miss Tina Coral Caged Fringe Top, $14.94, Size S-XXL from Wal-Mart. The skirt is another piece that I had been eyeing on the Asos site but just didn’t know how to pull it off without wearing basic black with it. As I mentioned last week I want to start wearing mixed prints but didn’t find one to really bring out the green & black in this skirt. So as I was browsing the Target website last week I came across these coral open-toe pumps, $29.99, sizes 5.5-11. Luckily they were part of the buy one get one half-off sale so I also bought another pair as well. I figured if I couldn’t wear a mixed print like I orginally wanted to then wearing an odd color with the skirt may work just as well. Therefore I came up with the idea to match the coral shoes with the shirt and bring out the bronze on the top of the shoe with this bronze tassel belt from IGIGI, $65. Vest and Earrings both by Ashley Stewart. 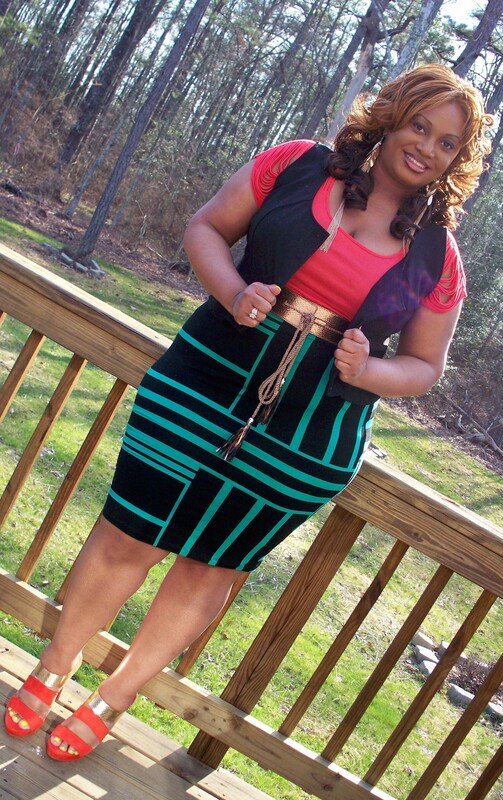 Moral of the story…don’t be hesitant to mix and match both prints AND colors! You are so blessed to celebrate your grandmother’s 94th birthday and you did it with style. Love the shoes!